Brimming with honesty and emotions, Kat L. Robertson’s poems are evocative, meaningful and powerfully moving. Light of Truth is a journey to understanding the meaning of love; examining expressions of love and ultimately embracing love itself. The water colors reflect the mood of the emotions evoked through the poetry. Some speak of the pain and suffering that love entails while others talk about longing and loneliness. They stir wonderful emotions that will make the readers believe in love as something pure and true. The poems are a spectacular blend of hope, longing, sorrow, dreams, joy and the power of love. 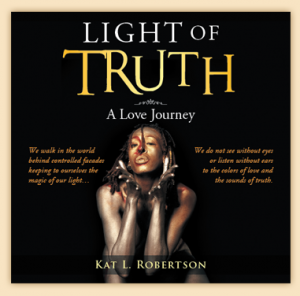 Join her journey through the power of rhythmic words in Light of Truth * A Love Journey. Copyright © 2014. Kat L. Robertson. All rights reserved.